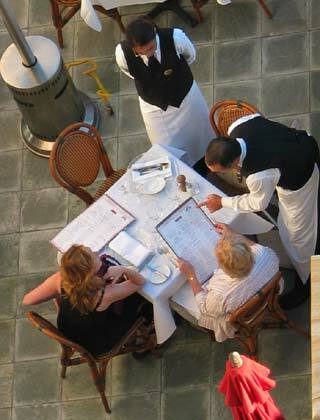 Beverly Hills Restaurants - This list of restaurants from the Beverly Hills Convention and Visitors Bureau reads like a "Who's-Who" list of high-end dining, including famous restaurants such as The Stinking Rose, Spago Beverly Hills, CUT at the Beverly Wilshire, Mr. Chow and more. Those seeking a more economical meal can find cafes, coffee shop, pizza parlors, cafeterias and plenty of other restaurants to accommodate any budget. Restaurant Row - The original "restaurant row" in Los Angeles, a section of La Cienega Boulevard, just north of Wilshire Boulevard that contains a selection of world-famous restaurants including The Stinking Rose, Lawry's Prime Rib, Matsuhisa, Fogo de Chao, Morton's The Steakhouse and others. Restaurants on and Near the Miracle Mile - Dining options for L.A. County Museum of Art (LACMA), The Petersen, La Brea Tarpits, the Craft and Folk Art Museum and other art galleries on Wilshire Boulevard east of Fairfax Avenue. Many options are available, such as food trucks, cafeterias, fast food, and fine dining, as well as late night entertainment. Downtown L.A. 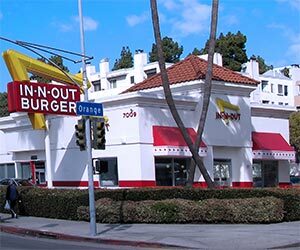 Restaurants - There are hundreds of restaurants in downtown Los Angeles, and you can normally find something to eat within walking distance of any attraction. If you prefer a particular restaurant or cuisine you'll find it on this list. Food and Drink at West Third Street - Third Street between Farmers Market and the Beverly Center offers an array of restaurants, shops and other dining options. The area is located about a mile from the museums. Little Ethiopia Restaurants and Attractions - Little Ethiopia is located about a half mile south from the Petersen auto museum, and offers about a half dozen Ethiopian restaurants, as well as some shops selling antique furniture, vintage clothing, custom jewelry and hand-made items. Dining at The Grove - Restaurants, cafes, snack shops and specialty shops located at The Grove, which is adjacent to Original Farmers Market. The Merchants of Farmers Market - Farmers Market offers an adjacent Dupar's restaurant and prepared meals inside the market, as well as local fresh fruits, vegetables, poultry, meats, candy and other treats. Hollywood Restaurants - A list of restaurants from the Hollywood Chamber of Commerce. Includes some restaurants in West Hollywood and Universal City. 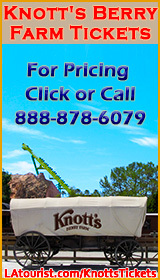 CityWalk Hollywood Restaurants - Casual dining, quick-service cafeterias and snack stands. The list of restaurants includes Bubba Gump Shrimp Company, Hard Rock Cafe Hollywood, Saddle Ranch Chop House, Tony Roma's Wolfgang Puck's and many more. CityWalk Hollywood is adjacent to Universal Studios. Burbank Dining Guide - A list of more than 50 restaurants, cafes and diners in Burbank, including phone numbers and web links, provided by the City of Burbank. Long Beach Restaurants - A list of restaurants from the Long Beach Convention and Visitors Bureau. You can view the list by category, and/or by selecting a specific area of Long Beach. Marina del Rey Restaurants - A list of restaurants from the Marina del Rey Convention and Visitors Bureau. View the list alphabetically, by cuisine, by meal type or by price range. (Click here to view Marina del Rey restaurants on Google Maps). Santa Monica Restaurants - A list of restaurants from the Santa Monica Convention and Visitors Bureau, divided into sections of the city. Includes the Third Street Promenade, Main Street, Montana Avenue, the Santa Monica Pier and more locations. 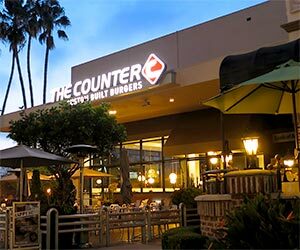 West Hollywood Restaurants - A list of over 140 restaurants from the West Hollywood Marketing and Visitors Bureau. Includes restaurants in hotspots such as Santa Monica Boulevard, Sunset Boulevard, Melrose Avenue, Robertson Boulevard and more. Drive Thru Fast-Food - Many fast-food restaurants in Los Angeles are "drive thru's" where you can order food from your car and take it to go. You already have a McDonald's where you live, so consider trying a local favorite, such as El Pollo Loco (fast-food chicken that is so good, you will talk about it even after you get home), L.A.'s favorite hamburgers* at In-N-Out, or late-night chili burgers at Original Tommy's (a chain of hamburger-stand-like restaurants). Another good choice is the original Pink's Hot Dogs on La Brea Avenue near Melrose and Hollywood -- on weekdays the lines can be reasonable if you miss the lunch crowd. * Disclaimer: In-N-Out Burger might or might not be "L.A.'s favorite hamburgers" but they sure are yummy! Gourmet Food Trucks - A number of food trucks in Los Angeles have evolved beyond the "roach coach" (are we allowed to say that?) lunch trucks that frequent construction sites. The trend has been to upscale some of those trucks with a fancy paint job and new menus that rival some of the best sit-down restaurants. You can usually find gourmet food trucks near tourist attractions and in business districts that host large office buildings. This website offers a food truck map (powered by Google) and Twitter feed to follow posts from selected trucks. The map only covers about a dozen trucks, but it seems where you find one truck there are usually others. 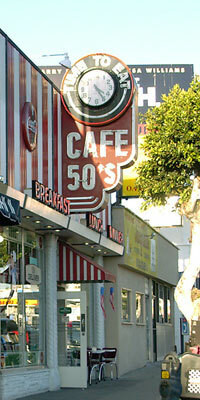 Cafe 50's in West L.A.
Dine LA - A dining guide that is offered by the L.A. Tourism and Convention Board. Includes spotlights on restaurants and chefs, dining suggestions by theme, feature articles, contests, news and more. Where the Locals Eat - Restaurants that are not chains or franchises. Includes hundreds of local restaurants, rated by price and cuisine. Zomato Dining Guide - (formerly known as Urban Spoon) Restaurant listings in the Los Angeles area, including user reviews and maps. Open Table Los Angeles - Online reservations at over 1000 restaurants in Los Angeles, Long Beach and Orange County. Includes a physical address for each restaurant, a website link (as applicable) and a map link. L.A. Bite - Take-out meals from local restaurants are delivered to your home, hotel room or business. Browse menus from restaurants located within Los Angeles and Orange County, and have your lunch or dinner delivered to you. Grub Hub - Similar to L.A. Bite, you can browse menus from local restaurants and have the meal delivered to your location. Pink Dot - One of the original L.A. grocery delivery companies, Pink Dot delivers groceries, sandwiches and other items to Hollywood, West Hollywood, the Miracle Mile, Beverly Hills, Century City, and other parts of the westside. They are open late. Yummy.com - Grocery delivery to a larger area than Pink Dot, and offers more items. However there is a higher minimum for free delivery so check both sites to decide which works best for your needs. Order online or see the contact list for the phone number of the nearest store.